Fully Featured Double Oven with LED Minute Minder. This double oven allows you to cook several meals at different temperatures at once and also has a grill function. Its ceramic hob and enamel-lined oven cavities are easy to clean. 4 "Rapidlite" zones provide fast heating and the smooth ceramic surface makes wiping clean after use easy. With a 69L capacity fan oven, whether you're cooking for yourself or the whole family, cooking meals is made easy and effortless. The Fan oven allows for even temperature distribution across the whole oven - you can be assured of great results no matter which oven level you use. For ultimate convenience, there is a second oven and grill in the top cavity. If you're making a Sunday roast for the whole family it ensures you have plenty of oven space. It is also great if you wish to cook parts of your meal at different temperatures or just want to grill some sausages while other food cooks in the main oven. Easy to use, this LED clock can be used as a countdown timer, with an audible alert, or it can be set to display the time of day. However you choose to use this function, it will help you keep track of cooking times. 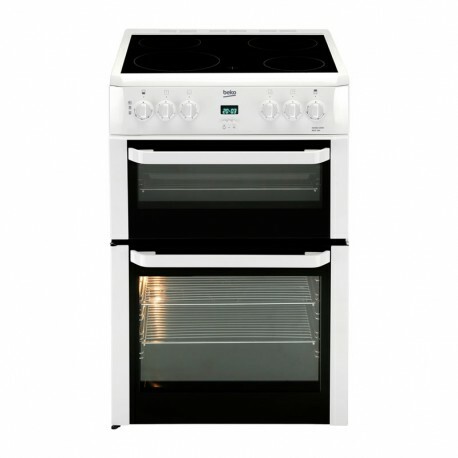 Both ovens on this Beko cooker score "A" for energy efficiency.